I know I post belly pics about every 2 weeks, but I just love them so here's another! Last weekend we went camping with fellow scooter enthusiasts. 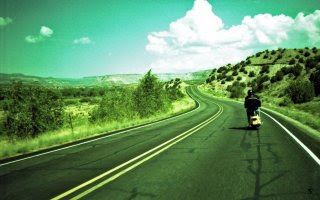 This is the third year we've gone to Camp Scoot up in the gorgeous Jemez Mountains. It was good fun, and there are always people we love seeing there, and a lot of them we only see once a year because we live so far from eachother. It was really nice reconnecting with fellow scoot people. Here are some pictures of the shenanigans that ensued. It got silly, as it does every year. When things get boring, out comes the beer bungee or someone suddenly emerges from the shadows wearing a lucadore masks tackling each other. I didn't do any scooter riding this year (for obvious reasons), but I drove behind the pack with Laura in the truck, and we went to Jemez Springs where we had lunch and checked out the VW show they were having there that day. Sadly, I'm retarded and didn't take any pictures of us. Duh. Laura took some, so maybe I'll post those later if she'll be so kind as to send them to me *hint*. Here are some pictures of us from Camp Scoots from the past. New tile in the kitchen...Finally! We actually did this two weeks ago, but I've been a bad blogger and am just posting it now. Our kitchen tile was a lovely Miami Vice style pink, gray, and blue marble. The connected dining room features concrete slab painted orange, and the connecting foyer area donned a normal, off-white tile. Pete, Laura, and I (mostly Pete and Laura) ripped up all the old stuff, and we set down a lovely light tan 18" tile throughout the entire area. It looks so much better! Here's a photo-journal of our progress. Ultrasound time!!! Laura worked her magic, transferred this video from VHS to digital format, and had me do a voice-over to explain what we are looking at. Enjoy your first glimpse! I exploded this week. I am suddenly ginormous! Here's the photographic evidence. That's all! I think the picture is awesome enough that a goofy random video is unnecessary. Oh, and we get to hear the heartbeat tomorrow! Yay! My best friend Laura works on a cruise ship in the Caribbean. Well, she's switching ships and will be moving to a European cruise, and has a two month break before her next run starts. Since she's my best friend and I hardly ever get to see her, Pete and I offered her our guest bedroom during her break. Her mom lives in Colorado, so it's a short enough drive, but far away enough so as to not drive Laura nuts! She's been here for a week, and it's amazing how she is the one and only house guest I've ever had that Pete and I can stand having around for more than a couple of days. Don't get me wrong, I love you all and want you to visit often, but Pete and I want our privacy too. Catering to guests can wear on a person. Laura is awesome, though! She doesn't want to put us out at all, does our dishes (which we both hate doing), and doesn't leave stuff all over the house. She even offered to paint for me since I can't be around the fumes. She already painted our third bedroom, which I call the kid room. It's a REALLY dark room, and the prior owners painted it dark green. ??? Why would you paint a dark room a dark color? Well, she painted it a lovely shade of mellow yellow. It looks awesome! She also went maternity clothes shopping with me, which Pete hates to do. Every time he comes along to a maternity store, he want to be in and out in no less than 5 minutes. It's REALLY annoying. Well, hooray for girls because we spent well over an hour there and I got to even try stuff on. What a concept! I even stuffed my shirt with the strap-on pillow available in each of the dressing rooms. How do I look? It's also nice because she's on a budget. We don't have to go out and spend money going all over town. She's cool with the freebie and cheap stuff. A woman after my own heart! Another bonus, she's coming with Pete and me to Camp Scoot! I am terrified of riding the scooter while pregnant. Crashing and bruising my own body up is one thing...crashing and banging my belly. Not going to happen. So, I was going to be the official camp dog sitter while Pete and the other scooterist were out on their rides. Now I have someone to keep me company! Yay! Here she is in the Lorikeet cage at the zoo. We went with the kids I watch earlier this week. It's so nice to have such an awesome and considerate friend around. We met in 7th grade, and I'm pretty dang sure we're going to be friends until the day we die. We totally get each other, we love the same stuff, we know each other's dirty little secrets (tee-hee! ), and our personalities just mesh perfectly. Plus, Pete totally loves her! I'll be sad when she goes in a few weeks.